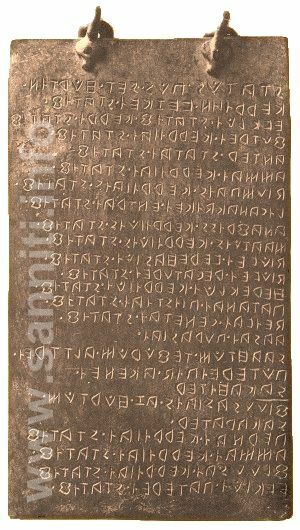 The bronze tablet of Agnone, measuring 28x16,5 centimetres, with an handle at very top, is today preserved in the British Museum of London. 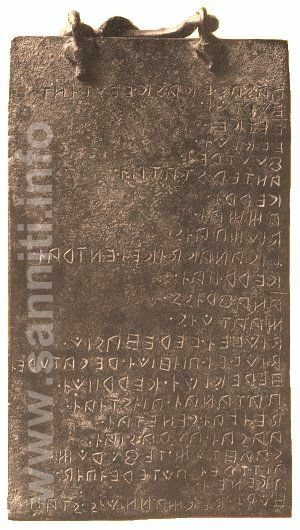 It is by far the most important inscription in oscan language after the Abellano's boundary stone and the Tabula Bantina much larger in size, going back to 250 b.C. according to the way the letters of the alphabet were written. honor to the goddess Ceres took pace is being described onto the first side. The inscription also tells that within that sacred compound every two years would take place a special ceremony on the altar of the fire. It continues saying that every year during the Floralia season they should offer sacrifices to four different gods. This side of the tablet just depicts the religious aspect, the rules and the dates to be observed. The other side instead, clearly states which santuary and divinity to offer prayers within the outdoor compounds after removing the icons from the regular temple. The "Saahtum Tefurum" must be within the fire's area. Then it goes on describing that only those paying regular dues were to be admitted to the sanctuary, it lists an inventory of items pertaining to the sanctuary, the name of the congregants and the directory of those in charge. 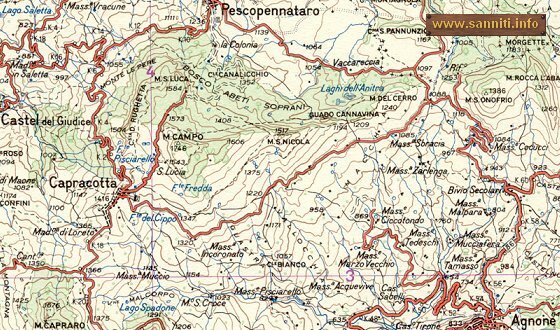 This small wooded area close to the village of Agnone would have been located in the proximity of the Cerro' mountain, between Capracotta and Agnone (loc. Fonte del Romito), where just about a century ago this tablet was found by Mommsen. The local slang language called it "Uorte" or kitchen-garden, from the latin name Hortus and Horz sculped onto the tablet. As mentioned before, this particularly holy place was dedicated to the goddess Ceres and people paid dues for its upkeep. On special dates processions took place where as special stops were made on each of the fifteen altars within the holy garden. Every two years a symbolic fire was begun for special offerings. Outside this garden, special offerings were made to goddess Flora and other divinities. All together, the tablet of Agnone mentions 17 gods proving the Samnites' poli-worshiping dedication. All these Gods were linked to the agriculture, the harvest and the fruits as it is underlined by the word Kerriais or Cereals. Above all, major importance is being given to Kerres or Ceres. The holy place where these religious functions took place were all dedicated to this goddess and all the other Olympus' gods venerated by the Samnites. All of them, with Ceres at the very top, had to be honored and invoked for their propitious help in safeguarding the earth and its fruits. So that Ceres was the pivotal deity of all the religious activities taking place in this "holy garden" a rather sacred place fully representing the religious awe the inhabitants had for the agriculture. It is not by a coincidence this tablet made of bronze, a special metal used in honor to the Ceres the goddess, was uncovered in the proximity of what today is called Cerro' Mountain or Ceres' Mountain.